A front-side bus (FSB) was a computer communication interface (bus) often used in Intel-chip-based computers during the 1990s and 2000s. The competing EV6 bus served the same function for AMD CPUs. Both typically carry data between the central processing unit (CPU) and a memory controller hub, known as the northbridge. Depending on the implementation, some computers may also have a back-side bus that connects the CPU to the cache. This bus and the cache connected to it are faster than accessing the system memory (or RAM) via the front-side bus. The speed of the front side bus is often used as an important measure of the performance of a computer. The original front-side bus architecture has been replaced by HyperTransport, Intel QuickPath Interconnect or Direct Media Interface in modern volume CPUs. The term came into use by Intel Corporation about the time the Pentium Pro and Pentium II products were announced, in the 1990s. "Front side" refers to the external interface from the processor to the rest of the computer system, as opposed to the back side, where the back-side bus connects the cache (and potentially other CPUs). An FSB is mostly used on PC-related motherboards (including personal computers and servers), seldom with the data and address buses used in embedded systems and similar small computers. This design represented a performance improvement over the single system bus designs of the previous decades, but sometimes is still called the "system bus". Front-side buses usually connect the CPU and the rest of the hardware via a chipset, which Intel implemented as a northbridge and a southbridge. Other buses like the Peripheral Component Interconnect (PCI), Accelerated Graphics Port (AGP), and memory buses all connect to the chipset in order for data to flow between the connected devices. These secondary system buses usually run at speeds derived from the front-side bus clock, but are not necessarily synchronized to it. In response to AMD's Torrenza initiative, Intel opened its FSB CPU socket to third party devices. Prior to this announcement, made in Spring 2007 at Intel Developer Forum in Beijing, Intel had very closely guarded who had access to the FSB, only allowing Intel processors in the CPU socket. The first example was Field-programmable gate array (FPGA) co-processors, a result of collaboration between Intel-Xilinx-Nallatech and Intel-Altera-XtremeData (which shipped in 2008). Setting an FSB speed is related directly to the speed grade of memory a system must use. The memory bus connects the northbridge and RAM, just as the front-side bus connects the CPU and northbridge. Often, these two buses must operate at the same frequency. Increasing the front-side bus to 450 MHz in most cases also means running the memory at 450 MHz. In newer systems, it is possible to see memory ratios of "4:5" and the like. The memory will run 5/4 times as fast as the FSB in this situation, meaning a 400 MHz bus can run with the memory at 500 MHz. This is often referred to as an 'asynchronous' system. Due to differences in CPU and system architecture, overall system performance can vary in unexpected ways with different FSB-to-memory ratios. In image, audio, video, gaming, FPGA synthesis and scientific applications that perform a small amount of work on each element of a large data set, FSB speed becomes a major performance issue. A slow FSB will cause the CPU to spend significant amounts of time waiting for data to arrive from system memory. However, if the computations involving each element are more complex, the processor will spend longer performing these; therefore, the FSB will be able to keep pace because the rate at which the memory is accessed is reduced. Similar to the memory bus, the PCI and AGP buses can also be run asynchronously from the front-side bus. In older systems, these buses are operated at a set fraction of the front-side bus frequency. This fraction was set by the BIOS. In newer systems, the PCI, AGP, and PCI Express peripheral buses often receive their own clock signals, which eliminates their dependence on the front-side bus for timing. Overclocking is the practice of making computer components operate beyond their stock performance levels by manipulating the frequencies at which the component is set to run, and, when necessary, modifying the voltage sent to the component to allow it to operate at these higher frequencies more stably. Many motherboards allow the user to manually set the clock multiplier and FSB settings by changing jumpers or BIOS settings. Almost all CPU manufacturers now "lock" a preset multiplier setting into the chip. It is possible to unlock some locked CPUs; for instance, some AMD Athlon processors can be unlocked by connecting electrical contacts across points on the CPU's surface. Some other processors from AMD and Intel are unlocked from the factory and labeled as an "enthusiast-grade" processors by end users and retailers because of this feature. For all processors, increasing the FSB speed can be done to boost processing speed by reducing latency between CPU and the northbridge. This practice pushes components beyond their specifications and may cause erratic behavior, overheating or premature failure. Even if the computer appears to run normally, problems may appear under a heavy load. Most PCs purchased from retailers or manufacturers, such as Hewlett-Packard or Dell, do not allow the user to change the multiplier or FSB settings due to the probability of erratic behavior or failure. Motherboards purchased separately to build a custom machine are more likely to allow the user to edit the multiplier and FSB settings in the PC's BIOS. The front-side bus had the advantage of high flexibility and low cost when it was first designed. Simple symmetric multiprocessors place a number of CPUs on a shared FSB, though performance could not scale linearly due to bandwidth bottlenecks. The front-side bus was used in all Intel Atom, Celeron, Pentium, Core 2, and Xeon processor models through about 2008. Originally, this bus was a central connecting point for all system devices and the CPU. The potential of a faster CPU is wasted if it cannot fetch instructions and data as quickly as it can execute them. The CPU may spend significant time idle while waiting to read or write data in main memory, and high-performance processors therefore require high bandwidth and low latency access to memory. The front-side bus was criticized by AMD as being an old and slow technology that limits system performance. More modern designs use point-to-point connections like AMD's HyperTransport and Intel's DMI 2.0 or QuickPath Interconnect (QPI). These implementations remove the traditional northbridge in favor of a direct link from the CPU to the Platform Controller Hub, southbridge or I/O controller. 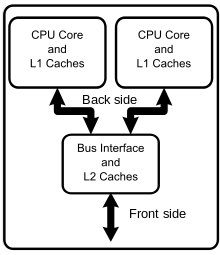 In a traditional architecture, the front-side bus served as the immediate data link between the CPU and all other devices in the system, including main memory. In HyperTransport- and QPI-based systems, system memory is accessed independently by means of a memory controller integrated into the CPU, leaving the bandwidth on the HyperTransport or QPI link for other uses. This increases the complexity of the CPU design but offers greater throughput as well as superior scaling in multiprocessor systems. The number of transfers per clock cycle depends on the technology used. For example, GTL+ performs 1 transfer/cycle, EV6 2 transfers/cycle, and AGTL+ 4 transfers/cycle. Intel calls the technique of four transfers per cycle Quad Pumping. Many manufacturers publish the frequency of the front-side bus in MHz, but marketing materials often list the theoretical effective signaling rate (which is commonly called megatransfers per second or MT/s). For example, if a motherboard (or processor) has its bus set at 200 MHz and performs 4 transfers per clock cycle, the FSB is rated at 800 MT/s. The specifications of several generations of popular processors are indicated below. ↑ Scott Mueller (2003). Upgrading and repairing PCs (15th ed.). Que Publishing. p. 314. ISBN 978-0-7897-2974-3. ↑ Todd Langley and Rob Kowalczyk (January 2009). "Introduction to Intel Architecture: The Basics" (PDF). "White paper". Intel Corporation. Retrieved May 28, 2011. ↑ Charlie Demerjian (April 17, 2007). "Intel opens up its front side bus to the world+dog: IDF Spring 007 Xilinx heralds the bombshell". The Inquirer. Retrieved May 28, 2011. ↑ "Nallatech™ Launches Early Access Program for the Industry's First FSB-FPGA Module". Business Wire news release. Nallatech. September 18, 2007. Retrieved June 14, 2011. ↑ "XtremeData Offers Stratix III FPGA-Based Intel FSB Module". Business Wire news release. Chip Design magazine. September 18, 2007. Retrieved June 14, 2011. ↑ Ashlee Vance (April 17, 2007). "High fiber diet gives Intel 'regularity' needed to beat AMD". The Register. Retrieved May 28, 2011. ↑ "XtremeData Begins Shipping 1066 MHz Altera Stratix III FPGA-Based Intel FSB Module". Business Wire news release. XtremeData. June 17, 2008. Retrieved June 14, 2011. ↑ Allan McNaughton (September 29, 2003). "AMD HyperTransport Bus: Transport Your Application to Hyper Performance". AMD. ↑ "An Introduction to the Intel QuickPath Interconnect" (PDF). Intel Corporation. January 30, 2009. Retrieved June 14, 2011.